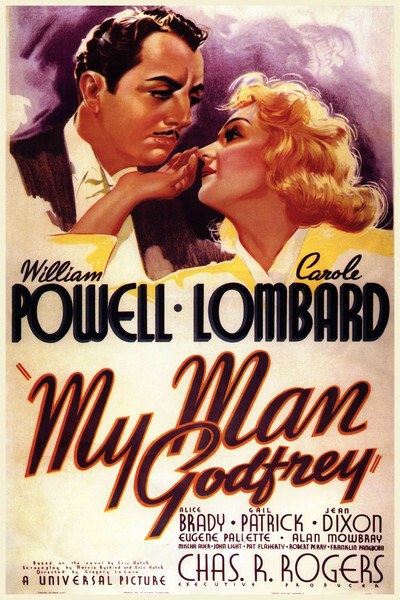 "My Man Godfrey," one of the treasures of 1930s screwball comedy, doesn't merely use Lombard and Powell, it loves them. She plays Irene, a petulant kid who wants what she wants when she wants it. His Godfrey employs an attentive posture and a deep, precise voice that bespeaks an exact measurement of the situation he finds himself in. These two actors, who were briefly married (1931-33) before the film was made in 1936, embody personal style in a way that is (to use a cliché that I mean sincerely) effortlessly magical. Consider Powell, best known for the "Thin Man" movies. How can such reserve suggest such depths of feeling? How can understatement and a cool, dry delivery embody such passion? You can never, ever catch him trying to capture effects. They come to him. And Lombard in this film has a dreamy, ditzy breathlessness that shows her sweetly yearning after this man who fascinated her even when she thought he really was a bum. Like Preston Sturges' "Sullivan's Travels" (1941), Gregory La Cava's "My Man Godfrey" contrasts the poverty of "forgotten men" during the Depression with the spoiled lifestyles of the idle rich. The family Irene brings Godfrey home to buttle for is the Bullocks, all obliviously nuts. Her father, Alexander (that gravel-voiced character actor of genius, Eugene Pallette), is a rich man, secretly broke, who addresses his spendthrift family in tones of disbelief ("In prison, at least I'd find some peace"). Her mother, Angelica (Alice Brady), pampers herself with unabashed luxury and even maintains a "protégé" (Mischa Auer) whose duties involve declaiming great literature, playing the piano, leaping about the room like a gorilla and gobbling up second helpings at every meal. Her sister Cornelia (Gail Patrick) is bitter because she not only lost the scavenger hunt but got pushed into an ash heap after insulting Godfrey. And there is the maid, Molly (Jean Dixon), who briefs Godfrey on the insane world he is entering. She loves Godfrey, too, and perhaps down deep so does Cornelia, and so might the protégé, if he didn't like chicken legs more. God, but this film is beautiful. The cinematography by Ted Tetzlaff is a shimmering argument for everything I've ever tried to say in praise of black and white. Look me in the eye and tell me you would prefer to see it in color. The restored version on the Criterion DVD is particularly alluring in its surfaces. Everything that can shine, glimmers: the marble floors, the silver, the mirrors, the crystal, the satin sheen of the gowns. There is a tactile feel to the furs and feathers of the women's costumes, and the fabric patterns by designer Louise Brymer use bold splashes and zigs and zags of blacks and whites to arrest our attention. Every woman in this movie, in every scene, is wearing something that other women at a party would kill for. These tones and textures are set off with one of those 1930s apartments that isintendedto look like a movie set, all poised for entrances and exits. I found myself freezing the frame and simply appreciating compositions. Notice a shot when Godfrey exits screen right and the camera pans with him and then pushes to poor, sad Irene, seen through sculptured openings in the staircase and chewing the hem of her gown. Look for another composition balanced by a light fixture high on the wall to the right. You'll know the one. "The Thin Man" is also reviewed in the Great Movies collection.